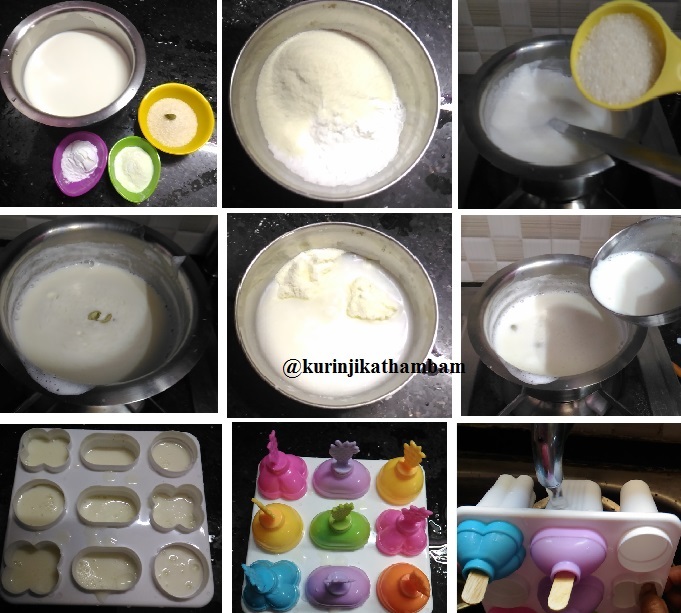 Those who are from villages of Tamil Nadu cannot forget the "Paal-Ice" (milk ice cream bar) of the old days. Today it is completely extinct with branded ice-cream vendors everywhere. 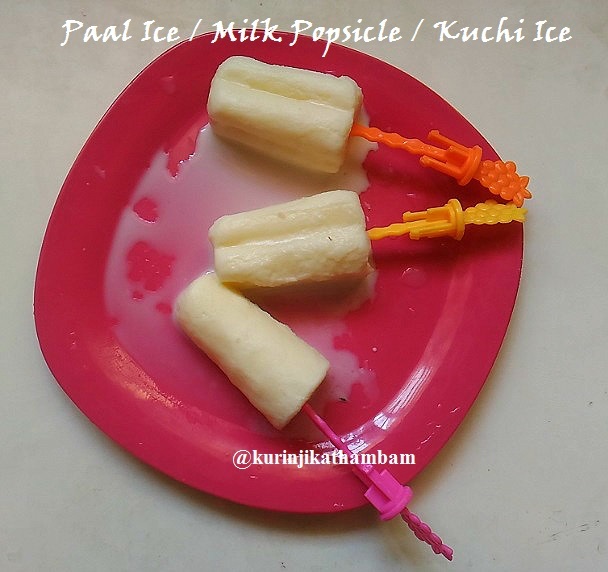 If you are nostalgic of "Paal-Ice", you should definitely try this Milk Popsicle; It is also very easy and quick to make. Milk Popsicle is definitely worth a shot!!. Preparation Time: 10 mins | Freezing Time: 6-8 hrs | Yields: 6 nos. 1. Mix corn flour and milk powder together. Then add ¼ cup of milk and mix them well without lumps. 2. Heat the remaining milk, then add sugar and stir well till the sugar dissolves completely. 3. Now add the cardamom powder and mixture (from 1) into the milk slowly. At this time you should keep the flame low. 4. Stir continuously till the milk mixture becomes little bit thick. Switch off the flame and allow it to cool down completely. 5. Now pour this mixture in the popsicle moulds till the ¾ of the mould. Close the lid of the mould with caps or foil papers. Freeze it for 6-8 hours or overnight. 6. Take it out of the mould from the freezer after they set. Pour the water at the backside of the mould or keep the mould under running water for just few seconds. 7. Now gently remove the popsicle from the mould and serve it immediately. 1. You can use condensed milk instead of milk powder. 2. 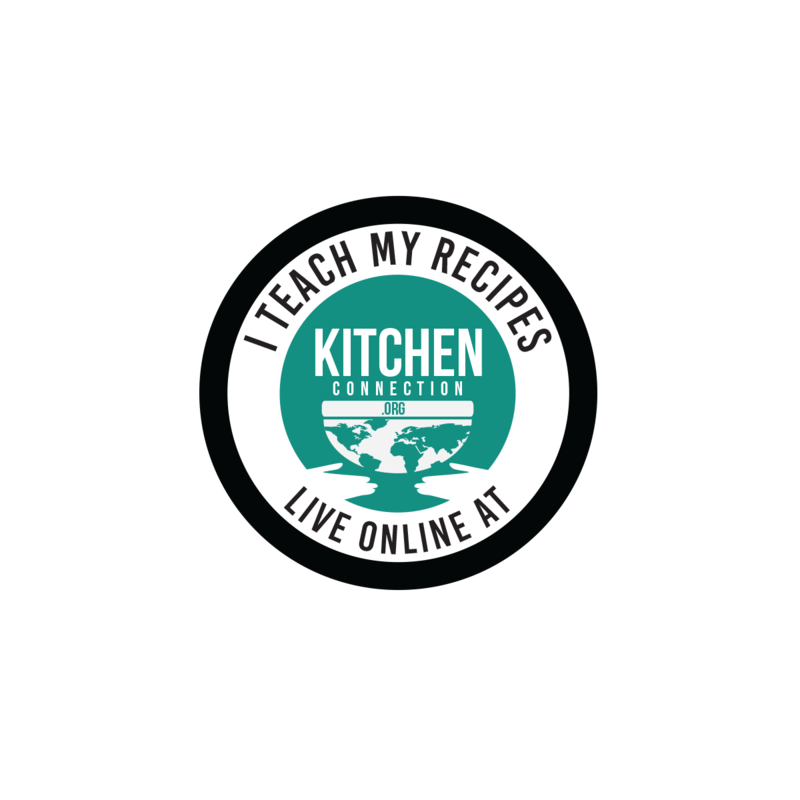 If you don’t have milk powder, replace one more tbsp of corn flour instead of milk powder. 3. You can use vanilla essence instead of cardamom powder.